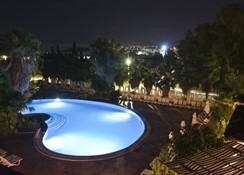 The Medisun Hotel lies in the heart of Ortakent, just a short journey from central Bodrum. The region is especially popular with visitors to Turkey, thanks to the beautiful beaches, fantastic water sports and beautiful Mediterranean weather. Ortakent beach is just a short walk from the hotel, while the nearby village has plenty of shops, markets, bars and restaurants to discover. Alternatively, the hotel complex itself boasts a wide range of activities to keep the whole family entertained. The Medisun Hotel offers guests an outdoor swimming pool with a separate pool for children and a relaxing sun terrace with loungers and parasols, surrounded by greenery. Further leisure facilities include tennis courts, a wellness area offering massage services, a sauna, a Turkish bath, a fitness gym, basketball and volleyball, table tennis, badminton, mini football, a children's playground, a TV lounge and a playroom. The entertainment team also organize daytime activities and games for all ages. The main restaurant has indoor and outdoor seating and offers buffets of Turkish and international dishes, show cooking and theme nights. There is also a pool-side bar serving drinks, snacks and light meals, an A la Carte restaurant, a beach cafe and a lounge bar. The hotel has a gift shop, and services offered include 24 hour reception, internet access, safety deposit boxes, laundry, towel hire and a tour desk. Each room features a private balcony, telephone, double or twin beds, air conditioning, and an en suite bathroom with bath and shower, hairdryer and an additional telephone. Other in-room amenities include radio channels on TV, a small fridge, and satellite TV (2 English channels). One of the rooms has been adapted for disabled guests and is available on a request basis. There are 113 guest rooms at the Medison Hotel, each of which has air conditioning, an en-suite with a bath and shower, double/twin beds, a sofa bed, satellite TV with music channels and a direct dial telephone, a hair dryer, a mini bar and a balcony. The All Inclusive program consists of breakfast, lunch and dinner all served buffet style. There is snacks served in the morning and afternoon and afternoon tea is available. The All Inclusive drinks program ends at 11 pm. Chargeable extras: Imported drinks, fresh fruit juices, a la carte restaurant. Medisun Hotel is located 100 meters from Yashi beach and a short walk from Ortakent beach. The local buses (called Dolmus in Turkey) pass every few minutes to take guests to Bodrum Center (13 km). 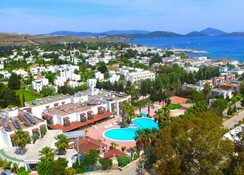 Ortakent is approx 4 km from Bodrum Airport.